What happened? I painted a happy doughnut while listening to Pink Floyd’s The Wall. But I get a somber, solemn, gloomy, and a bit spooky doughnut when I listen to The Righteous Brothers. A friend of mine gave me an idea yesterday about it (thanks, Kathleen!). Maybe it’s because The Righteous Brothers are beggars. Beg beg beg, plead, plead, plead. Yeah, sure, it’s great music, but apparently not good for painting a cheerful doughnut. But why did Pink Floyd make such a happy doughnut? Maybe how you feel ABOUT the music is just as important as the music. The Wall moves me. I get it better now. That made me happy. Or maybe it’s like the weather system. Always trying to balance high pressure and low pressure. 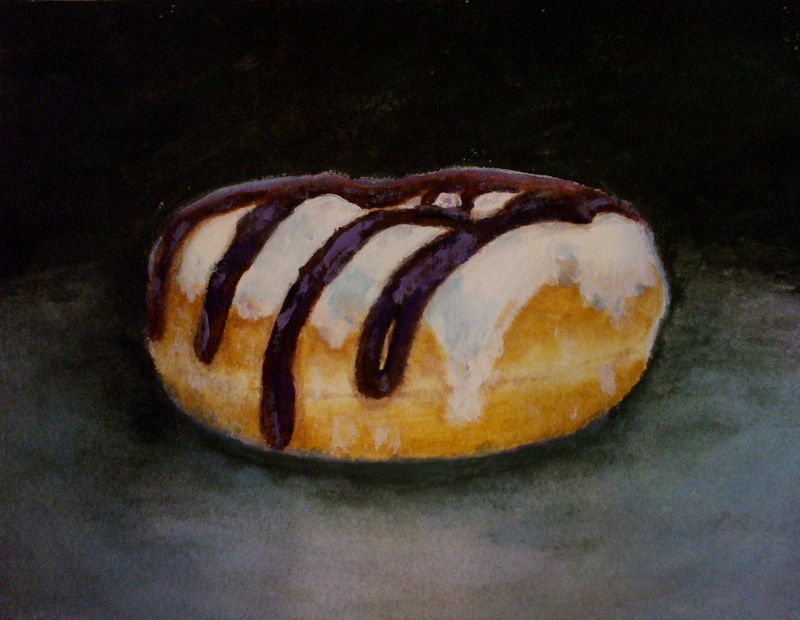 Or maybe it was just time to paint a gloomy doughnut. Well that’s neither here nor there. The finished product makes me happy – I’ve learned a few things since the last doughnut, I can see where I need more practice, and I’ve managed to avoid some chores I’ve been putting off. So all in all, I’m happy with gloomy. Alice, this is so beautiful! You are very talented!!! This is so great! Best still life ever. I would like to eat the somber doughnut!